The Tosa Log Cabin, which may be from the 1920s, or the 1830s-50s, is being moved to make way for new apartments. Published Feb. 8, 2019 at 1:26 p.m.
After two false starts, the rustic-looking "Tosa Log Cabin" at 2515 N. Wauwatosa Ave., is slated to be moved to its new home on the northwest corner of 64th Street and North Avenue overnight on Wednesday, Feb. 27, as long as the weather cooperates. 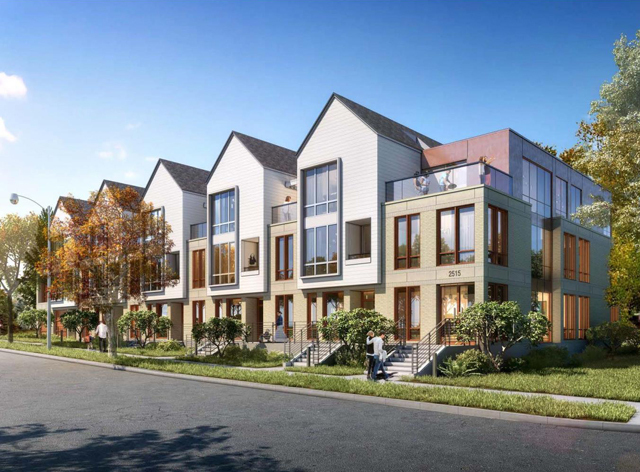 It is being moved to make room for construction of a new three-story, 27-unit residential building, called Gallatin Apartments, designed by Kahler Slater Architects. The developer of the new apartment building, Chris Houden, said last year that the cabin was being given to Galbraith Carnahan Architects, 6528 W. North Ave., for use as office space. According to the Wisconsin Historical Society's Architectural Inventory, the cabin was erected in 1921 to plans drawn by Scott & Mayer at a cost of $15,000, by railroad executive Frederick D. Underwood. The cabin was initially on a nearby site called Few Acres Farm, a 7.5-acre plot on the northwest corner of Wauwatosa and North Avenues, where the two-story Underwood mansion also stood. Research by Charles Mitchell suggests that it might have been built much earlier than the 1920s. Mitchell says Underwood, "moved the old farmhouse where he was born to a position near his retreat and maintained the interior just like it was when he was a child. He lived in this small house instead of the mansion when he visited Wauwatosa." He references two sources that suggest the log cabin is actually that childhood home, which would place its construction, Mitchell says, between 1838 and 1859. But, Mitchell adds, "An article in the Milwaukee Journal of July 28, 1955, a tribute to Underwood and his estate in Wauwatosa, states that the log house was built in 1926 by Underwood for his son." What's not debated is that the cabin was moved to its current site, across the street from the Wauwatosa Cemetery, in 1955 after the city bought the land for its new Longfellow School. In recent years, the cabin was used as office space. In December, crews could be seen readying the 5,000-square foot cabin for the move, including excavating around the foundation. In the meantime, excavation and the building of a new foundation at 6404 W. North Ave. was being completed. Scheduled overnight moves in mid-December and early January were postponed. Now, the plan is to make the move later this month, according to a post on the City of Wauwatosa portal. "The log cabin is being moved to 6404 W. North Avenue. It will be in position before the morning commute," notes the web site. "If you haven't seen a move like this before, it is quite a sight to see. The cabin ... will be moved in its entirety. "You can anticipate a rolling street closure on North Avenue, but our Fire and Police Departments will still be able to get to you if needed. You can expect to see work crews in the weeks following the move as they secure the foundation and building in its new place."